I've previously said that I almost never spend much time alone. So when Morticia planned a day out with her Mum and the kids I jumped at the chance to to go out and about on my own. 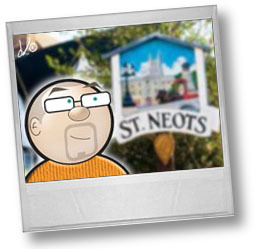 We are staying at my Mother-in-law's so my day out, unless I planned to jump on a train or bus, would be in the town of St Neots. The town centre is only 20 minutes walk, it was dry and a little misty which made for a lovely walk. I'd been looking forward to the idea for weeks, it's not a big deal but the solitude was really therapeutic. I had lunch in the local cafe, a mooch around the charity shops and visited a few pubs and sampled a few ales. Reading my cycling magazine in the pub whilst drinking ale all on my own was absolute bliss. I returned and followed my big day out with a visit to the chippy, mmmmmm. Elgood's Black Dog (3.6% ABV) - A proper English mild, smooth and flavourful. in the Coach House, St Neots. Potbelly Brewery's Potbelly Best (3.8% ABV) - Easy drinking bitter. Young's London Gold (4.8% ABV) - A light refreshing ale. in the Cambridgeshire Hunter, Eynesbury.